We want you to feel welcome at Maternity BVM, whether you are coming for a wedding or a funeral, visiting from out of town, or looking to find a new church. The following practical points will help the practical details get out of the way. Where is Maternity BVM Church? We are located at 308 E. Marsile St., in Bourbonnais Illinois. The restrooms of our very beautiful historic church were added many years after it was first built in 1858. We apologize that they're a little difficult to find if you're not familiar with our church. So, let us help you locate them by following these directions. You will find the restrooms located behind the sacristy... behind the altar. The most convenient way to access them, without disrupting the Mass, and drawing very little attention to yourself in doing so, is to venture out the main doors of the church (going outside), making a left, around the corner to the side of the church where the grotto/cemetery is located. Follow the sidewalk along the side of the church building until you find a door located on the left side. There is a step up. The men's and women's restroom is just inside that door, along with a drinking fountain for your convenience. If you are unable to use that step up into the doorway, and need a handicapped accessible ramp, then please feel free to use the ramp located way up in the front of the church that is on the St. Joseph (right) side of the church. You will enter that door and walk straight back. We ask that you accompany young children outside and around to the restroom, and please do not let them run up and down that handicapped accessible ramp during Mass. If you need further assistance, please ask an usher and they will be happy to guide you. We have a parking lot right outside the Church entrance. However, for most Masses, this lot fills up first. You can find additional parking directly behind the church, at the school building. This school building is where our parish Religious Education classes are held, and where parish events are often held. In addition, the area wide Bishop McNamara Catholic school holds classes here during the week for grades Pre-K through 6th grade. The current church building was built in 1858. 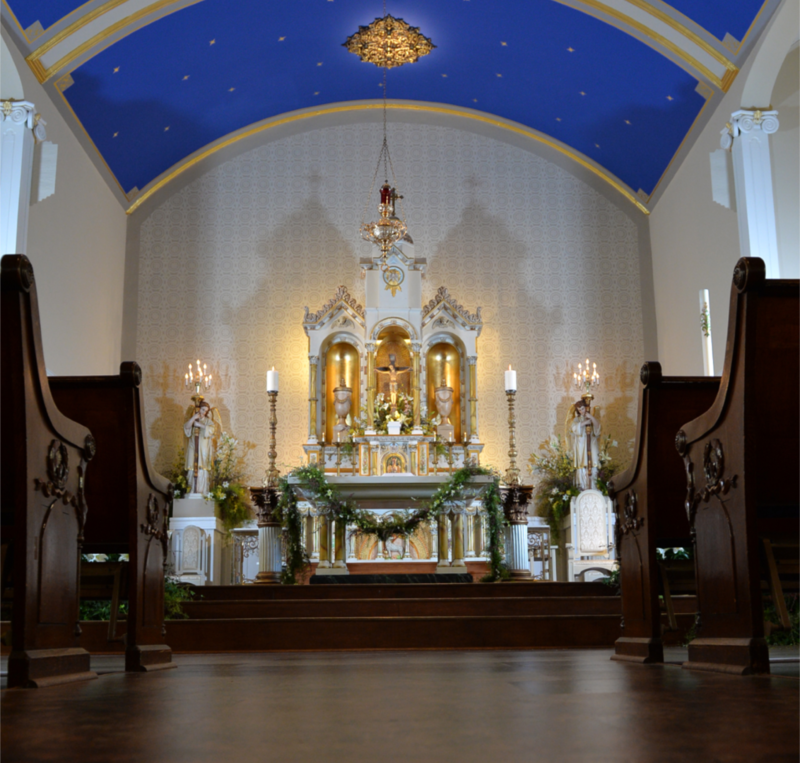 For more about our parish history, click here. Understandably families with small children can be self-consious about their children making noise. Families should know that they are not only welcome at church, but encouraged to bring their children to Mass. To accomodate to young families, we offer a "Children's Liturgy of the Word", on most Sundays at the 9:00 a.m. Mass. This is offered for 3 year olds through 2nd grade. This is an opportunity for the children of that age group to be escorted by adults and youth leaders to St. Viator's hall (back by the restrooms), where they hear the readings and gospel in a way that young children can understand through creative storytelling and activities. The children are then escorted back into the church right before the "Our Father", and returned to their families. 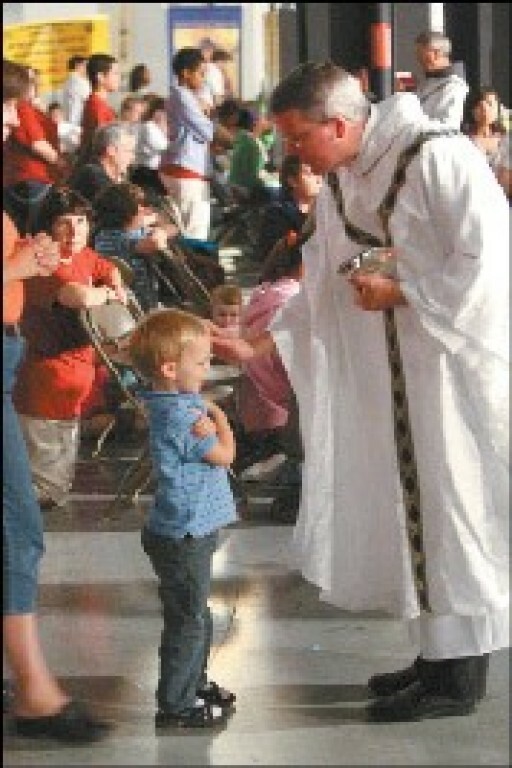 Children are not obligated to participate, and are welcome at any Mass during the week or on the weekends. For further information on the Children's Liturgy of the Word, click here. The parking lot outside the main doors of the church have several handicapped parking spots, but they fill up fast. In addition, the pews up at the front of church are handicapped accessible pews. If you need assistance getting into a pew, please ask an usher to help. We ask that older children and adults refrain from eating or drinking in our sanctuary. Babies and toddlers may be fed as needed of course. We also ask that you do not chew gum during Mass. The words of the hymns, prayers, and readings for many services can be found in the Breaking Bread book found in the pews. Some hymns are found in the green Gather hymnal also found in the pews. Hymns are organized by number and the numbers are usually posted on the Hymn boards on two front pillars of the church. Numbers marked by a Green marking before then number indicate that hymn is found in the green Gather Hymnal. On Sundays the readings are found in the Breaking Bread under the days date. This will be the first number listed on the Hymn Board. Those of us in the Catholic Church who have received Catholic instruction and have made our first Holy Communion through the Catholic Church, will receive the Holy Eucharist Body and/or Blood, during communion. You will notice that those of us in the Catholic church who have not yet received their first Holy Communion, will also walk up to communion, and will cross our arms over our chest for a special blessing. Likewise, we invite all guests and visitors, Catholic or not, who have NOT received their First Holy Communion in the Catholic Church, to come up with everyone else, and simply cross your arms over your chest when coming up during Communion to receive a special blessing.